From brisk walks amid trees that look like they’re on fire to glorious sunrises and sunsets and catching the last sightings of wildlife filling their bellies before they hibernate the winter away, there’s so much to love about the autumn. A particular favourite for many, though, is the food. Autumn is a season for comfort food. We’re talking roast dinners, rich, warming stews, and of course, a delicious dessert made from the latest harvest of autumn fruits. In desserts isn’t the only place to use those harvests, though. Read on for some alternative ways to bring the fall fruit harvest into your savoury cooking! Gammon is something you don’t see much, unless it’s on the menu for a pub lunch! And anything you can eat out, you can make ten times better in your own kitchen if you put your mind to it! This dish puts a new spin on the classic combination of pork and apple as well as incorporating seasonal favourites celeriac and leeks. It’s sweet, it’s salty, and it serves four so it’s a great recipe to crack out for a family lunch, or to make for yourself and enjoy leftovers for most of the week! 50g butter – salted or unsalted, it’s your choice! Put the celeriac in a separate saucepan and fill with water so that the celeriac is completely covered. Sprinkle with a little salt. Bring the pan to the boil, then leave to cook for 15-20 minutes until the celeriac is soft. Once ready, drain away the water and mash until smooth. Stir in the cooked leeks and the rest of the butter and season well. Set to one side and keep warm! Add the apples and apple juice to another, smaller pan and cook for 10 minutes on a medium heat until the apples have broken down. Then, stir in the mustard and the pinch of sugar. In the frying pan you used for the leeks, heat the oil and fry the gammon steaks one at a time on a medium-high heat. To be cooked through, they’ll need 3-4 minutes on each side. 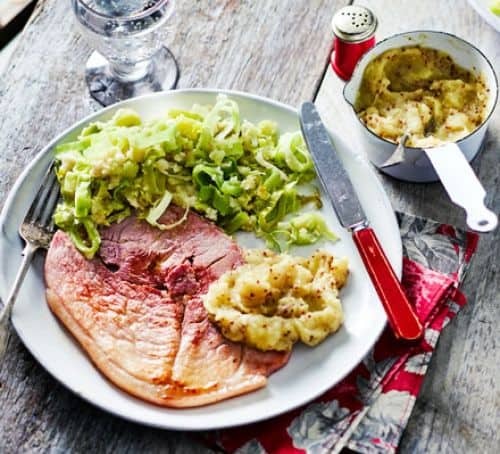 Serve the hot gammon steaks with the mash and apple sauce, and enjoy! Blue cheese and pear is another classic combination that you often find in summery salads. 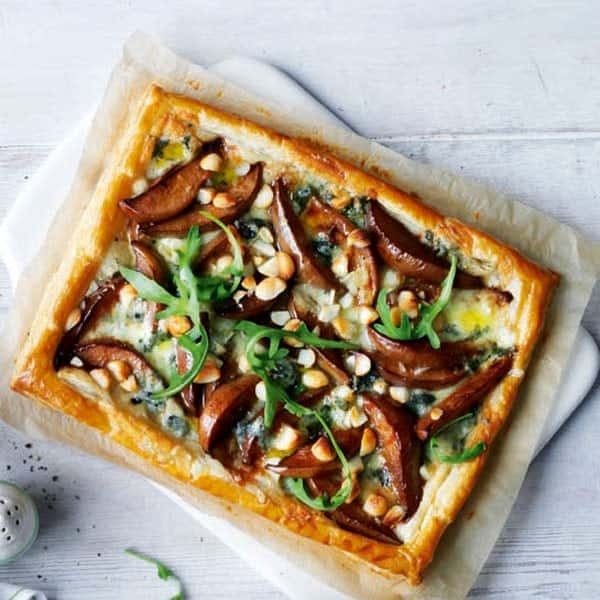 It’s far too cold for salad now, though, so why not take those ingredients and pop them into a puff pastry tart for a quick and easy but flavourful lunch? First things first, whack the oven on to pre-heat at 200 degrees Celsius, or gas mark 6. Unroll the puff pastry and score a border roughly the width of two fingers all the way around. Put the pastry on a lined baking sheet. Arrange the pears on the pastry, keeping them within the border you scored, then scatter over the cheese, crumbling as you go, and the handful of macademia nuts. Pop the tart in the oven and bake for 10-15 minutes until the pastry has puffed up and turned golden brown, and the cheese is melted and bubbling. Serve scattered with rocket and drizzled with olive oil and a little more balsamic vinegar. Yum! Quince is one of the more unusual autumn fruits you see on the shelves. You’d be forgiven for mistaking it for a pear gone a little bit wrong since they’re the same shape and colour, but quince have a lumpiness to them that you don’t get on an everyday pear, and they change from a pale-coloured fruit to ruby red during cooking! While the quince has fallen out of fashion in recent years, it’s making a bit of a comeback. 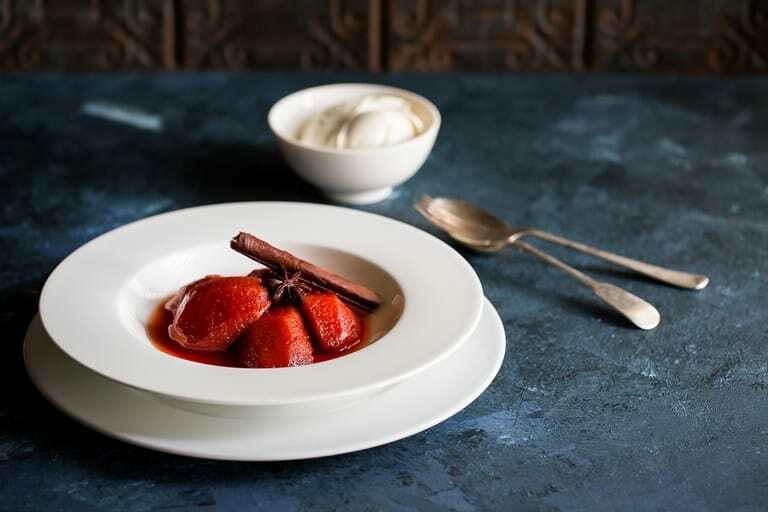 And, what better way to serve it than stylishly spiced and poached to perfection? In a large saucepan, heat the water, lemon juice and zest, cinnamon stick and sugar on a low heat. Stir continuously until all the sugar has dissolved. Add the quince pieces to the syrup and cover either with the lid of the pan, wedged so there’s a gap for steam to escape through by leaving a spoon in the pan, or with a cartouche. A cartouche is a piece of greaseproof paper cut to fit snugly in the top of the pan, and has a small hole cut in the middle for steam to escape through. Simmer the fruit on a low heat for 2 hours, or until the fruit is a deep red and is tender, and the syrup has reduced. Serve each person four pieces of quince in a little syrup, with a generous dollop of marscapone. Medlar fruit is one that, like quince, you don’t see every day in the supermarket, so you might think it’s tricky to get your hands on. This is likely either because many people don’t realise the fruit of the common medlar tree is edible, or because of that fruit’s appearance, which is, shall we say, not terribly appealing. It’s so unappealing, in fact, that it’s earned a few crude nicknames throughout history! But, don’t let its outside fool you, as this unattractive fruit is a treasure on the inside, and makes for delicious jams and jellies if you don’t fancy eating it as is! The process to make medlar jelly begins a week or two before you want to make jam, as you’ll need to blet your medlar – a phrase we never thought we’d say! Medlar fruit is usually bought rock hard, and before you can make jam with it, you need to allow the fruit a week or two to soften. This process is called “bletting”. Take the fruit off its leaves, then place the whole fruits on a shallow plate. Leave them in a single layer – don’t pile them up. Keep the fruit at a cool room temperature until they turn deep brown in colour and are soft and almost squishy to the touch. If you think they’re over-ripe and need to go in the bin, then they’re perfect! Don’t forget to keep back about 400g of medlar in the fridge to prevent them from bletting, as you’ll need firm fruit for this jam, too. When your medlar are fully bletted, remove any remaining leaves and check them well for rotting patches. Dark and soft is what you’re aiming for – not rotten! Take your firm medlar out the fridge and, along with the bletted medlar, slice each fruit in half and drop them into the largest, deepest saucepan you own. Cut each of the lemons and apples in half and add these to the pan, then pour over the water. Bring the water to a boil, then lower the temperature and partially cover with a lid wedged at an angle by a spoon left in the pan. Leave to cook for an hour, taking care that the water doesn’t all evaporate. You can give the fruit an occasional stir, but try not to stir or mash it too much if you want a clear jelly. Next, you’ll need to strain your fruit. There are gadgets you can buy specifically for this, but really all you need is a large piece of muslin that you can bundle into a bag, somewhere to hang it, and a large mixing bowl you can position underneath. Hanging the muslin bundle from your kitchen taps and placing the mixing bowl in the sink beneath is a good option. Once you’ve got your setup organised, pour the fruit and its liquid into the muslin bag and leave it so that the juice drips into the bowl beneath. Give it an occasional squeeze until all the juice has dripped through and what you’re left with is a dry lump of fudgy medlar fruit in the muslin, and a clear, amber coloured juice in the bowl. Pour the juice from the bowl back into a clean saucepan, bring it to the boil and keep it there for 6 minutes. Then, add about 800g sugar to the pan and keep the mixture boiling until the sugar has dissolved. Boil for a further two minutes and then ladle into clean, warm jam jars and seal. Leave to cool. If your medlar jelly hasn’t set to a jelly-like texture by morning and is still liquid, pour it back into a large saucepan and boil it again, for 4-8 minutes this time, before returning to the jars and cooling again. 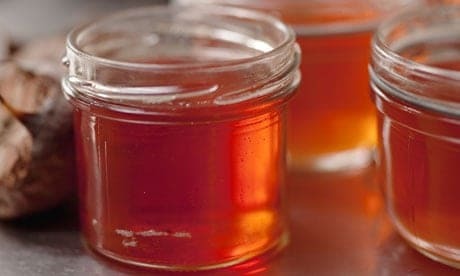 Enjoy your jelly as an accompaniment to meet, or with a cheeseboard!